Architects have many factors to consider when selecting an HVAC system for the projects they are involved with. Not only are there many different types of heating and cooling systems to choose from; architects must also weigh a myriad of other factors. For example, what is the appropriate size to maximize the temperature control given the facility exposure to extreme hot and cold temperatures? How should the balance between the need for energy efficiency with the cost of purchase and installation be viewed? How does the long-term reliability and ease of maintaining the equipment factor in the decision? Just these few questions show the complexity in decisions faced by the architect. What manufacturers have to consider is whether “brand” is important to architects when they are specifying and selecting the HVAC system (see What is Brand research). Since the heating system is one of the key components in any facility, architects should be involved with the brand of system specified. Today, however, because of the complexity and technical nature of building systems, many times the architect delegates these decisions to other professionals—the mechanical engineer or temperature control engineer. In addition, there are times when the owner has a brand preference or input into the brand specification. So while involved, it becomes really a question of degree. The important thing for manufacturers to gauge is that degree. Where does brand preference fit in? In an independent brand preference study conducted by Accountability Management Information, Inc. (AIM), overall architects indicated that “brand” was one of the most important factors they consider when selecting an HVAC system for their projects. On average, architects rated brand a 3.8 (with 1= not at all important and 5=extremely important). This was higher than other product categories studied. So, what is in a “brand” that makes it so important? A brand name can tell your customers and potential customers a lot about your company. A brand can represent an experience or a relationship a user has with your products. It is how people perceive you. A brand can set you apart from your competition. When architects specify a brand of product, it means they know your company and feel comfortable with the product and services your company delivers. Most architects do not want to jeopardize their relationship with their clients. Therefore, architects or engineers that specify a specific brand have done a large amount of due diligence to ensure the manufacturer can deliver a quality product and stand by their product if there are issues down the road. Nevertheless, in AIM’s architect preference study, only 50% of architects surveyed indicated they were involved with making brand specifications for building HVAC systems. While this was an increase of thirteen percentage from a previous study, it still means architects are not necessarily taking the lead when it comes to brand preference. In addition, the research indicated that 25% of the architects were involved but had no brand preference. So where can the HVAC system manufacturers impact the selection and purchase of their brand? Getting on the short list! Based on AIM’s experience conducting research and talking with architects, building owners, engineers and other building construction professionals, many have what they call a “pre-approved” list of brands or manufacturers they specify. This list is typically reviewed annually or periodically by several professionals in an organization. To be on the list, a product has to have a history of durability, good performance, superior service and support. The list contains brands of products that the professionals are familiar with and that have been proven to work. Once a manufacturer is on the pre-approved list, it is more probable they will end up in the specification. However, a brand’s position on the list is not “guaranteed.” Manufacturers must continue to provide service and quality products. Once a manufacturer “falls from grace,” it may be difficult to get back on the pre-approved list. The key to gaining ground in specifications and preference is to become a “basis of design”. This means that the architect or designer is calling out a specific brand that should be used to meet the objectives of the project. And while there will inevitably be other manufacturers listed as possibilities, it is the “basis of design” choice that drives the specification. It only makes sense, then, to become the “basis of design” to enhance brand selection and preference of a manufacturer’s product. To learn more about how often “basis of design” is used in HVAC specs, AIM used ConstructConnect™, (https://www.constructconnect.com/), an online construction database to get a better sense of how “basis of design” and brands are specified. By searching project specifications for “furnace/heater projects with Basis of Design” within a specific year we can understand more about how the specification for “basis of design” and specific brands has changed year to year. 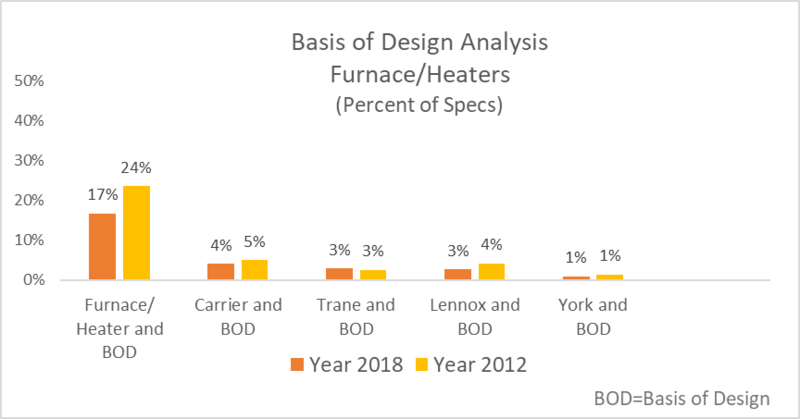 Interestingly, only 17% of projects in 2018 that had a furnace specification also included a “basis of design.” This is lower than in 2012, where “basis of design” was specified in 24% of the furnace specifications. Perhaps more indicative is that less than 1% of projects that had a furnace in the spec, also had “basis of design.” This could mean that the specifications for a specific brand as the “basis of design” are decreasing or architects are changing their spec to more of a proprietary spec, meaning no substitutions allowed. This type of specification analysis can also show manufacturers how often their brand is specified as the “basis of design,” and if it has shifted over a specific period. For example, this analysis example shows some brands have made a decrease in the specifications where their brand is the “basis of design” verses others where the percent has remained the same. Furnace/heating (HVAC) system manufacturers must continue to keep in mind that the market is constantly changing and can afford them an opportunity to gain a leadership position (as no one dominates). It is important to monitor where your brand stands in the specification path and take measures to ensure a consistent exposure to architects. Certainly, there is room for growth and the opportunity to reach and influence the specifications is unlimited. It is also important for HVAC manufacturers to continue to monitor and influence the “basis of design” in these specifications. By monitoring architect’s brand choice or use of a “basis of design” brand, will help manufacturers build and strengthen their brand position with architects. Since the building furnace and heating system is critical to the performance of any building, over time manufacturers may also want to look closer at what percent of the project is moving to an approved “proprietary” spec. AIM’s spec analysis showed cases where a specific “brand” was specified with “no substitutions” allowed. As heating and furnace technology advances, the architect needs to thoroughly understand the features and benefits your brand delivers. This includes knowing more about the importance of proper installation and the ongoing service/support your brand offers. Since there are many strong national HVAC system brands competing for the architect’s or owner’s business, service and support are one of the ways to differentiate your brand from “others” in the market. AIM’s research and experience in the building construction industry often indicates the following factors are critical to reinforcing and building brand loyalty. Availability—While a specific brand can be the “basis of design” or the brand of choice, if the product is not available when the contractor needs to install it, your efforts to impact the brand choice may ultimately fail. Service—The complexity of the HVAC system requires that your sales rep continue to build strong relationships with architects and engineers. The building construction market can be volatile and strong rep relationships and service can make or break your brand selection. Support—While rep relationships with your customers are important, the “support” offered by the manufacturer is also critical to building and maintaining brand loyalty. Not only do you need to keep the market “updated” on new products/services, but your website and product materials/programs need to be communicated regularly. Today’s market demands a continuous flow of content from the manufacturer. Often established and strong brands feel the market has all the information they need on their products and yet AIM’s research indicates product “influencers” such as architects, contractors and engineers as well as the purchasers always want more. This type of research on “basis of design” and brand can be done on the other product categories besides HVAC systems or on a specific brand. Let us know where your interests are. Thank you for reading.